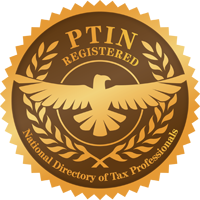 The PTINdirectory is an online searchable database of federally licensed tax preparers used by individuals and business owners to find tax preparers authorized by the Internal Revenue Service (IRS) to prepare tax returns. If you have a Preparer Tax Identification Number (PTIN) issued by the IRS, you should verify the accuracy of the information provided. Enter your last name, state and country of residence to search the database for your record. Issue yourself a new username and password. Get featured as the best tax preparer in your city (optional). PTINdirectory allows the registered tax preparer the flexibility to control how much or how little information is available for the public to see. This was done to address the concerns of the tax professionals and respect the privacy of their personal information that they had provided to the IRS before they knew this information would be publicly available under the FOIA. A tax preparer’s actual PTIN was not made available under the FOIA, is not asked for by PTINdirectory and, for security purposes, PTINdirectory discourages tax preparers from providing this number for public display in their professional profiles. The email addresses of tax preparers are not accessible to the users of the PTINdirectory website. The email communication available in the featured listing is done without revealing the tax preparer’s email address.